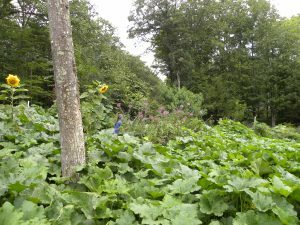 Early September continued to feel like July here in NH, which kept us busy picking produce, especially beans and squash. When the temperatures finally dropped, I was both relieved and sad. On the one hand – enough of picking beans! On the other – I miss all those beans! The month brought plenty of rain, with NH almost entirely drought-free by mid-month. Ideally, we would have seen more of the sun and fewer storm clouds, but given the floods elsewhere, I won’t complain too much. By the end of September, there was still no frost. I guess that’s our new normal. 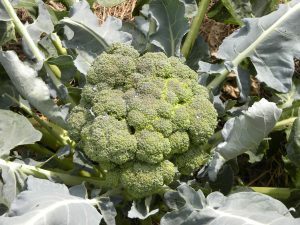 It allows for a little longer growing season, although with the daylight waning we don’t get as much out of an extra month of growth as one might expect. September is another busy month, with harvests coming in, and some of my off-farm activities picking back up. Finding time to sit down and write this was certainly challenging! Bringing in the harvest was on the top of this month’s list. 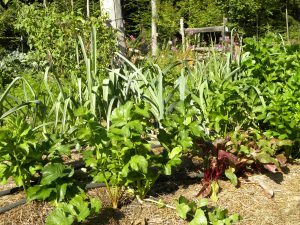 Some plants were continuing to produce, like string beans, kale, celery and summer squash, while others ripened up this month, especially the winter squash. 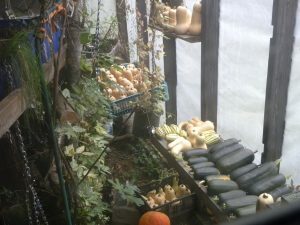 As they came in, many needed attention to preserve: freezing, lactofermenting and drying, plus making room for curing then storing the winter squash. We made pesto for the freezer and started hanging bags of beans up to finish drying. I have become fascinated with the great variety of dry beans that I can grow myself. I especially love the climbing varieties, which are so much easier on my back when it comes to picking! We dug the rest of the potatoes mid-month. We ended up with disappointing numbers due to the extreme rodent pressure this year. I averaged 4 or 5 pounds yield for every pound I planted – in the past I’ve seen up to a 15 to 1 return. So, I am changing my potato planting strategy. The past few years I have planted very late – May 23 this year – in order to avoid the Colorado potato bugs. It has worked great at thwarting the bugs, but it has meant that we hit drier times when the plants are trying to get established, then the late summer rodent explosion comes along before they are ready. The plants look beautiful, but I don’t get as high a yield. Next year, I will plant early again, and see how that goes. 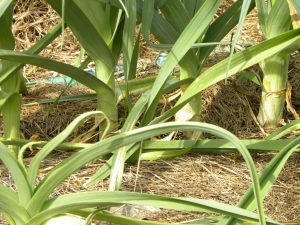 Leeks, Almost Ready – green tops loved by goats! 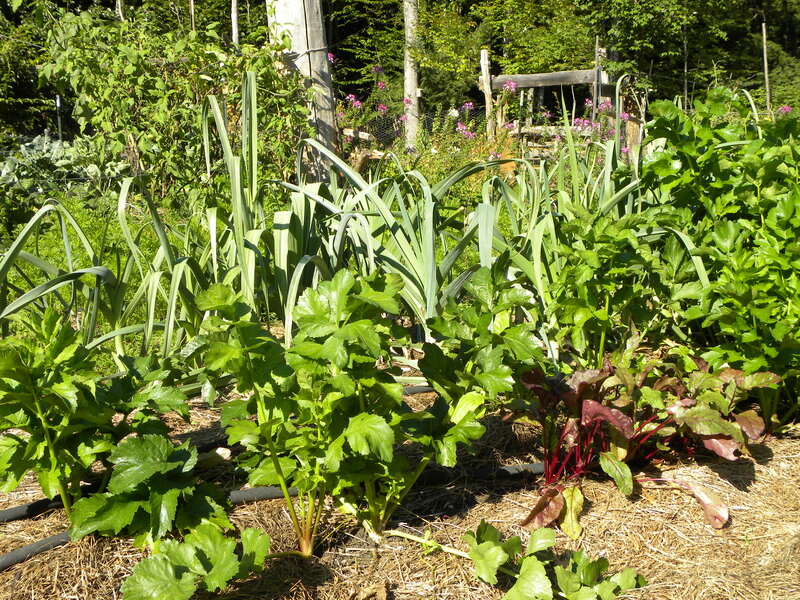 Going into winter, I do only minimal “cleaning up” of my gardens. I want as much plant material to stay put as possible, to add to the soil and to overwinter microbes. I do take out plants that are going by, but would still be enjoyed by goats! Such as: kale or collard leaves that are too chewed up by worms for my taste, broccoli and cauliflower leaves, and bean plants that aren’t producing fruit anymore. 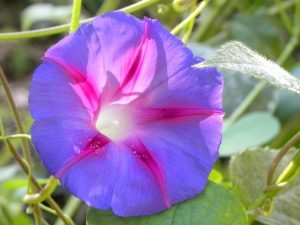 I cut rather than pull them out – the roots stay there to feed the soil. Some of the cover crops I also cut back to share with the animals while leaving all the roots. The goats love oatstraw and this year were very excited about the millet stalks. I did a little more planting of radishes and greens. I want to do more later season planting in upcoming years, but haven’t gotten the timing figured out. I plan to make up a more extensive planting schedule over the winter that will help me remember at the right time next year. The animals have grown up by now, at least into teenagers – no more babies! We had one day of poultry processing for the oldest boys, before they got too rough with each other. This is an otherwise easy, happy time for the critters, who still have plenty of forage of plants and insects, and love the cooler temperatures. We top off food and water, open and close gates, move fences and carry some forage to them, milk the goats twice a day and collect eggs. I did a thorough hive inspection early in the month, determining that the hives looked healthy and large enough to overwinter with great queens, but didn’t have enough honey. They were making progress with storing some, thanks to the Japanese Knotweed bloom, but I fed them to make sure they’d have enough. Altogether, from late August to the end of September, each hive got about 20# of sugar made into a syrup. I won’t be going back in, because they were already touchy at the last inspection. I don’t want to risk inciting robbing and fighting between my hives, after all this work! I know I saw raspberries as well, but they didn’t make it to the kitchen for weighing. I also started bringing in the drying beans, but those I don’t measure until I shell them, which will happen gradually over the fall. 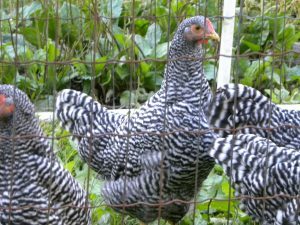 I brought home from local sources 10 5-gallon buckets of gleaned apples for the goats, and 25 5-gallon buckets of seaweed for the animals and gardens. From the animals we received 204 chicken eggs, 67 duck eggs, 10.5 gallons of milk, and about 15# of meat. We made 485 kwh from the PV solar panels. What we are still eating from previous years: honey, canned peaches, blueberries and strawberry jelly, dried kale and beans, frozen eggplant, and pesto. More harvesting, hopefully! I have barely touched the root crops which look promising, if the rodents don’t get them first. More dried beans will be ready soon. The Seminole squash vines continue to thrive and be impossible to see or wade through to determine if there are actually fruit ripening, so that mystery continues. We also expect 3 or 4 more days of poultry processing. I’ll plant my garlic mid to late October. That’s a task that has moved much later than when I first started gardening due to our warmer falls and later frost. Oh – and stacking wood is coming up! We’ll also continue off-farm gathering – apple drops, seaweed, and, soon, bags of leaves packed up for us from city-dwellers. Another active month expected!